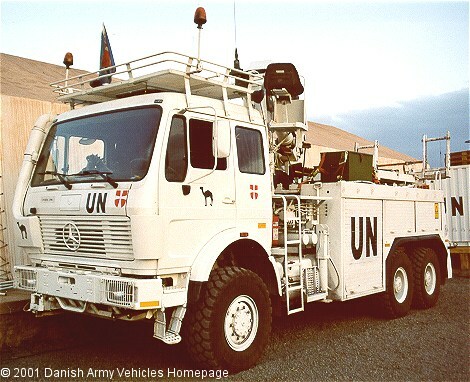 Danish Army Specific: This picture shows a Mercedes 2628 Recovery Vehicle just before departure to the former Yugoslavia as part of the DANBAT/UNPROFOR. 2 chassis, 1 with Hägglunds Moelv-gear (131 kb) (Norway) and 1 with Saferec-gear (102 kb) (Sweden) acquired in 1978. Another 5 produced by H.F. Nielsen's Maskinfabrik in Haslev (shown) were delivered in 1989. Further 2 recovery vehicles on IVECO Magirus MP380E42W chassis were ordered in 1995. Historical: The Mercedes 2628 series 12.000 kg truck was developed along the same line as the Mercedes 1628A and 2028A and shares many features and components. The 2628 does, however, have a heavier payload and can be used as an artillery tractor. Length: 8.26 m (322 inches). Weight: 26.000 kg (57.200 lb.). Engine: Own V8-cylinder, type OM 422, 14.618 cm3 (891 cubic inches) displacement, direct injection, liquid cooled. Horsepower: 280 at 2.300 rpm. Transmission: ZF 5S - 111 fully synchronized with crawler providing 8 forward and 1 reverse. Transfer case: 2-speed VG 1400. Electrical system: 12 volt (24 volt starter), negative ground. Tyres: 15.50/80 - 20 or 395/85 - 20.
without preparation: 1.2 m (47 inches). Additional: Servo assisted steering. Mounted with HMF 2752-K2 crane. 3 winches mounted; a ITAG WPH 200-1 (18 tons), a ITAG WPH 100-1 (10 tons) and a ITAG WOH 10-18 (5 tons).